teacher, coach, mentor and friend to thousands of young men during his 20-plus years as Hall of Fame track coach for the Leo Lions. 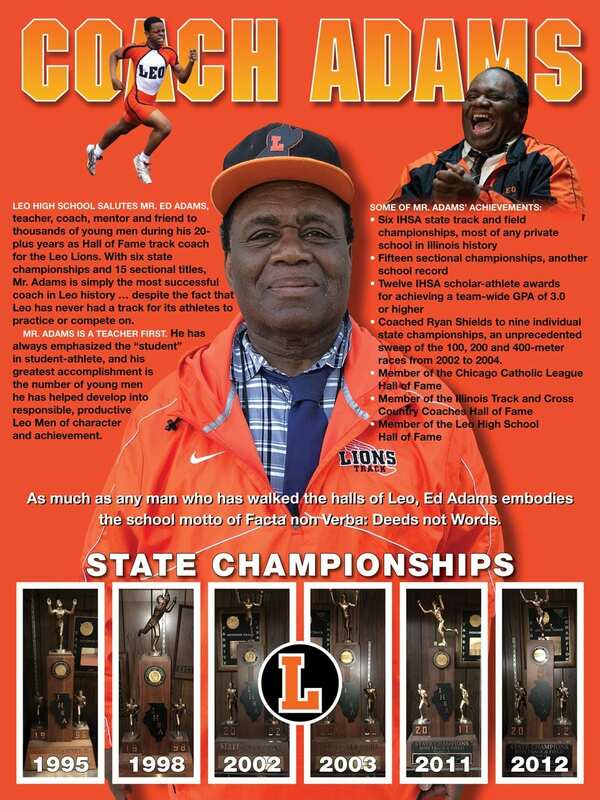 With six state championships and 15 sectional titles, Mr. Adams is simply the most successful coach in Leo history … despite the fact that Leo has never had a track for its athletes to practice or compete on. Mr. Adams is a teacher first. He has always emphasized the “student” in student-athlete, and his greatest accomplishment is the number of young men he has helped develop into responsible, productive Leo Men of character and achievement. Ms. LaDonna Hill is a Leo Treasure. The Leo Choir which she so skillfully and lovingly directs has become one of the school’s most visible and valuable assets, wowing audiences all over Chicago with their energy and talent. They draw their inspiration from Ms. Hill, a charismatic conductor who enhances any performance to which she adds her own lovely voice, all the while expressing her obvious love of music through her young charges. Whether they’re singing Christmas carols at Millennium Park, performing at various civic functions or entertaining residents of a neighborhood Seniors home, the Choir represents Leo in a manner that does us proud. The Christmas Concert and Spring Recital at Leo are among the most anticipated events on the school calendar. That success is a direct result of Ms. Hill’s hard work and dedication. She is a Leo treasure, and we thank Ms. Hill for her years of committed service. Harris, an outstanding young man. The Metropolitan Planning Council of Chicago honored John Canning with its Champions Award, in recognition of his efforts to build a safer, healthier, more efficient and more prosperous Chicago. A generous Leo benefactor, Mr. Canning is Chairman of the Madison Dearborn Partners investment firm, and his volunteer work as Co-Chairman of the Big Shoulders Fund is the centerpiece of his many charitable endeavors. Mr. Canning is a strong advocate for Catholic education, and a dozen Leo students receive tuition assistance through the Canning Foundation. 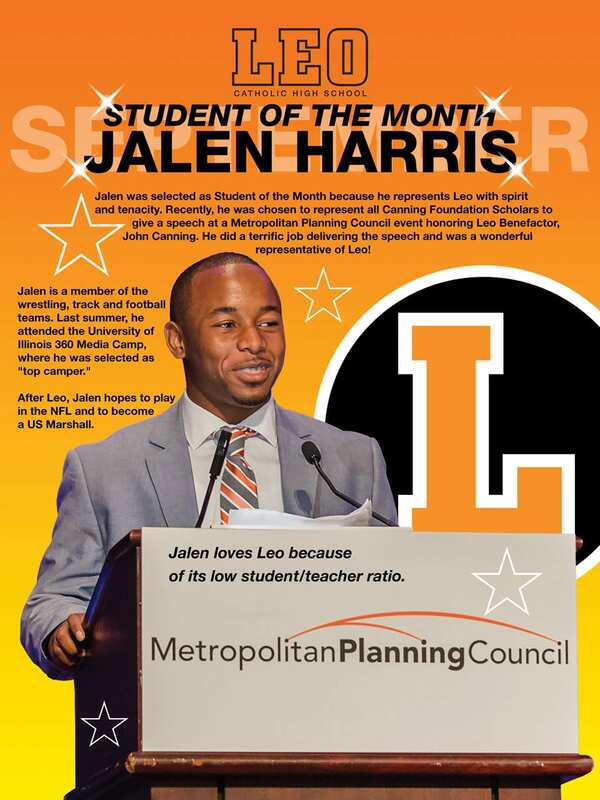 Because so much of his philanthropy is directed toward schools and school-age youngsters, the Metropolitan Planning Council asked Big Shoulders to provide a student speaker for the event to thank Mr. Canning and explain how a Canning Foundation Scholarship affects his life. Big Shoulders turned to Leo, and we were happy to offer Jalen Harris, a junior, an honor student, a three- sport athlete and the recipient of a Canning Foundation Scholarship. Speaking to more than 1,000 guests in the Grand Ballroom of the Hilton Hotel downtown, Jalen did a wonderful job of articulating how the scholarship helps his family cover the costs of his Leo education, how Leo is helping him “be all I can be,” and how Mr. Canning’s support for his scholars extends beyond financial. Jalen’s parents, Sam (a Leo grad) and Shayanta, looked on proudly. Afterwards, numerous guests approached the Harrisses and congratulated them on Jalen’s terrific speech. Planning Council Board Member King Harris, a past Champions Award recipient who introduced Mr. Canning, said Jalen represented “a symbol of hope” among Chicago-area young people.Jalen and his parents also got to meet Cubs Chairman Tom Ricketts, who was honored at the luncheon for uplifting the entire Chicago region via the Cubs’ 2016 World Series championship. Jalen worked hard preparing his speech, with the assistance of Leo Guidance Counselor Otto Horton. He acknowledged being “a little nervous” when he realized he’d be speaking to so many people, so he turned to one of his favorite football players for inspiration: Cris Carter, a Hall of Fame wide receiver for the Minnesota Vikings. 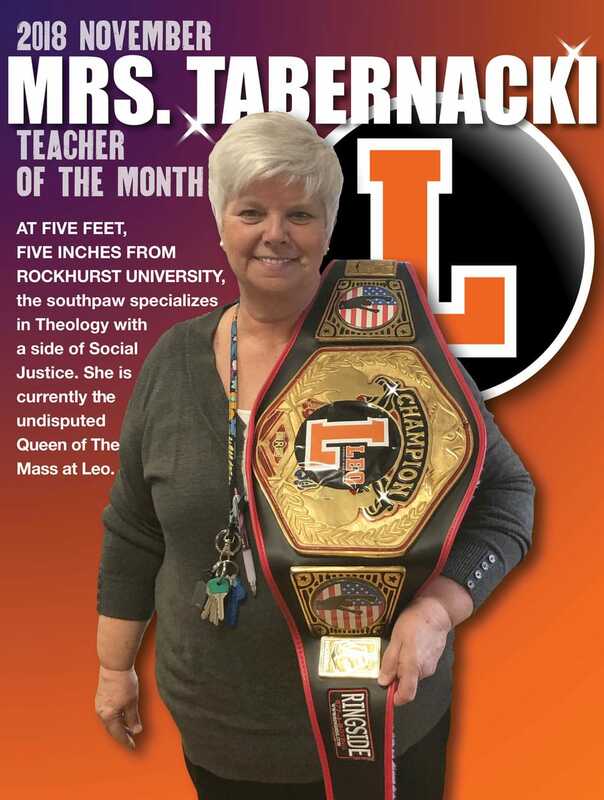 Mrs. Tabernacki: At FIVE FEET, FIVE INCHES from Rockhurst University, the southpaw specializes in Theology with a side of Social Justice. She is currently the undisputed Queen of The Mass at Leo. experience. 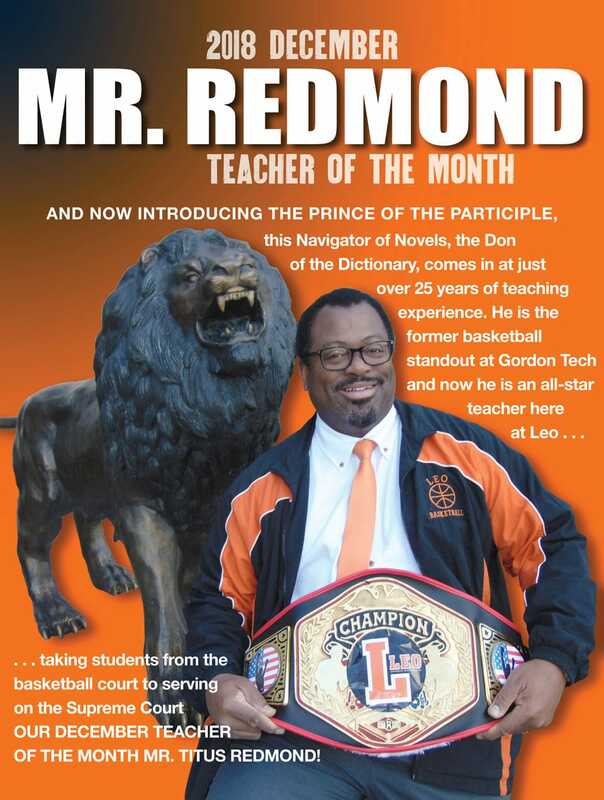 He is the former basketball standout at Gordon Tech and now he is an all-star teacher here at Leo . . .
of the month Mr. Titus Redmond!